Finished up my ‘sample’ skirt in time for the teen/tween skirt workshop I taught yesterday. I hadn’t done a ribbon hem before, but it’s a nice finishing detail: attach the ribbon to the WRONG side of the fabric by edge-sewing the top edge of the ribbon. 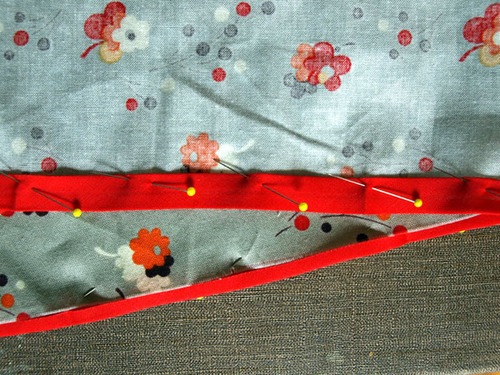 The ribbon should be overlapping unfinished hem (hanging at least an 1/8th below) so that when it’s folded up onto the right side of the fabric, it traps the unfinished edge inside. Edge-sew the other side of the ribbon in place. It was a quick two and a half hours, but the girls in the workshop made great progress on their skirts… finished the waistlines with the elastic, and already started attaching the ribbon hems. I’ll have to remember my camera for next week’s meet up. Two friends in the group picked out matching fabrics in two different color ways, a dark teal and a dark rose fabric… and I can tell they’re going to look very sweet in them! jay mccarroll recap with photos!